Hot tub jets are one of the best parts of a hot tub, but how do you choose the right spa jet for your needs? Learn more about hot tub jets here. When designing a hot tub, it’s important to consider what outcomes you hope to get from it. Hot tubs can provide numerous health benefits when designed and used in line with your personal needs and goals. One of the best ways to use a hot tub to improve your health is by strategically designing a spa with the right jets in the right spots. Knowing what types of jets are out there can help you determine which ones will be best for you and where to place them in your hot tub. How Does a Hot Tub Jet Work? 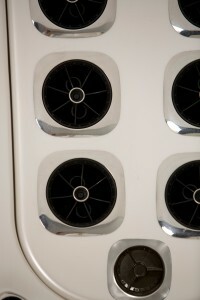 Spa jets are designed with varying degrees of power and size, and can be used for different purposes. There are four steps that must occur in order for a jet to work well and provide the desired outcomes. First, a pump moves the water through the pipes and toward the jets. Second, an air intake valve allows some air to get in and mix with the water. Third, the water and air are compressed as the diameter of the pipe decreases. And finally, the water and air are released through openings to create a hydromassage effect when they hit your body. What Types of Hot Tub Jets Are There? 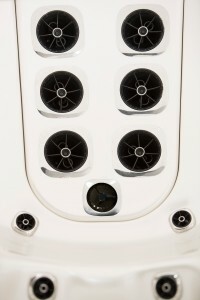 Hot tub jets also come in various styles and can be positioned according to the body parts you need targeted. Listed below are the types of jets you’ll find at Bullfrog Spas. The strongest and best hot tub jets will have two pumps with high horsepower, less plumbing, and the correct mixture of water and air. Jets with smaller openings will also feel more powerful, but will cover less surface area. Keep in mind that having too many jets will decrease water pressure, resulting in less powerful jets. Focus on designing a spa with specifically placed jets, rather than more jets. Spa jets can be positioned to provide relief to your back, neck, shoulders, spine, wrists, calves, and feet. Which Hot Tubs Are the Best? Choosing the best hot tubs according to the jet designs really comes down to individual needs and preferences, but when it comes to quality, there are brands that stand out from the crowd. 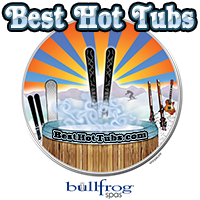 Bullfrog Spas are designed to be the most energy-efficient hot tubs. They also offer the most customizable JetPak options for perfect personalization. One way to determine whether the hot tub you are interested in is one of the best brands is to check online reviews. You should also avoid any company with poor service or unsatisfactory warranties. Look for hot tub manufacturers that use high-quality, durable parts, water care systems, and filters. Always choose a model that is energy-efficient and has proper insulation to keep operating costs low. Contact your local hot tub dealer today to get started on the design of your dreams. Don’t wait to take advantage of the amazing health benefits your own hot tub can provide.